A recent study linking fatalities of California’s endangered northern spotted owl to rodenticide poisoning on marijuana farms reignited the flaming debate about the use of chemical agents in agriculture. Yet as discussion rages on, farmers elsewhere are using owls as a pest control solution, hopefully preventing them from becoming pest control victims. And the idea seems to be taking off. Photo by Bill Gracey A mature barn owl delivers food to a young owl nesting in an owl box. Barn owls are cavity nesters, meaning they nest in places like hollow trees, open buildings, and nest boxes. Most farmers use rodenticides to minimize the damage that rodents can cause to crops, but it is no secret that these chemicals can have unintended effects, such as the secondary poisoning of non-target species. As a result, some people have attempted to find other ways of keeping pests at bay, including by attracting barn owls to fields to prey on rodents. Using barn owls as a form of biological pest control is certainly not a novel idea. First developed as a pest control technique through Malaysian studies in the 1970s, the idea truly took flight in Israel in 1981 when local researchers and farmers decided to test it out at Kibbutz Neot Mordechai, an agricultural community in the Hula Valley. 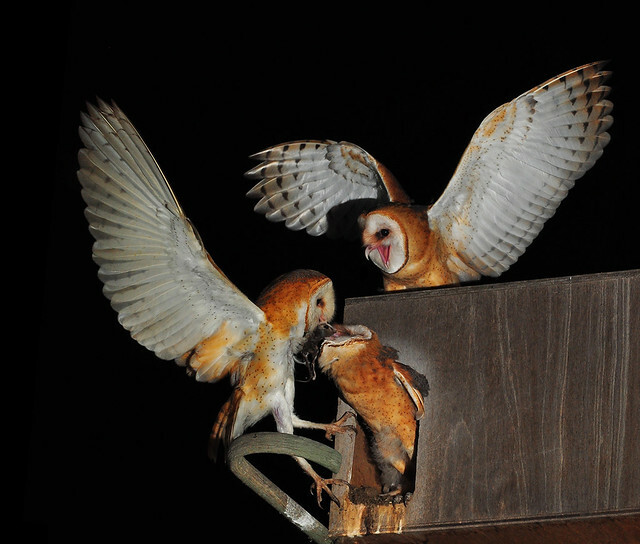 Led by the Society for the Protection of Nature, the Nature and Parks Authority, three keen researchers, and some local farmers, this project saw the installation of eight barn owl boxes, three of which were occupied within a year. (Barn owls are drawn to boxes as nesting sites.) However, like most scientific experimentation, the trial did not come without complications. A pioneering young nature conservationist with the Society for the Protection for Nature, Yehuda Weiss, who played a pivotal role in the research, was killed in action in Lebanon when war later broke out in June 1982, bringing the vital work in this area to a halt. This did not deter the researchers and farmers involved. Confident in the efficacy of the method following the trial and resulting nestbox occupation, they relaunched their project the following year in Israel’s Beit Shean Valley. Three decades later, and following plenty of ups and downs, between 3,500 and 4,000 owl boxes have been erected across Israel by open-minded farmers willing to give this method a try. The growing interest in natural pest control methods has spurred several related initiatives, including a national barn owl box program and a regional cross-border peace project with Jordan and the Palestinian Authority. Another recent initiative is the Shamir Research Institute at Haifa University’s Project Bird Box Israel. This group aims to assist farmers who wish to set up their own owl boxes through education and the provision of boxes. Dr. Motti Charter, Head of Project Bird Box Israel, is quick to credit local farmers for the success of this pest control method. Such methods require more than just barn owls and some willing farmers; having the correct infrastructure in place is key. Barn owls are cavity nesters, so farmers can attract them to an area with a rodent problem — and encourage them to remain and breed there — by erecting simple pole-mounted nest boxes. Project Bird Box Israel offers some assistance to farmers to help purchase the boxes, which cost $250 each, but Charter says that farmers personally pay 95 percent of the price themselves. Over in the US, Mark Browning, who owns the company Barn Owl Box, has supplied at least 5,000 boxes to farmers and landowners interested in testing out biological pest control. For him, it is not solely a business. It was Browning’s own satellite telemetry study on barn owls, which he conducted while working at the Pittsburgh Zoo, that encouraged him that this was a worthwhile cause. He spent a year and a half perfecting the perfect barn owl box design before putting it on the market. But sometimes the research speaks for itself. Indeed, a three-year study conducted by Browning and colleagues to measure the impact of barn owls on rodent populations on a 40-ha vineyard in California appears promising. The installation of 25 nest boxes on the vineyard led to the rapid growth of the barn owl population on the treatment site. As bird numbers grew, there was a significant decline in the number of gopher mounds. The researchers estimated that the birds consumed 30,020 rodents over three years. They also deemed biological pest control as more cost-effective than trapping or poisoning as it only requires one initial investment in the boxes, rather than repeated investment in traps or rodenticides. Barn owls are a species that lend themselves well to the task of pest control for several reasons, explains Browning. Unlike other birds, they are not territorial and are happy to nest near one another, as well as within close proximity to humans. They are also attracted to nest boxes, while the fact that they are not powerful fliers ensures that they won’t stray far from their prey source. All of these factors, along with the fact that barn owls pose no threat to livestock, has inspired landowners to test barn owl-based pest control through small initiatives in Argentina, the UK, and Indonesia. Other birds have also been shown to have a similar pest control benefit. For example, researchers in New Zealand found that vineyards with resident falcons had significantly fewer pest birds and less grape damage. While confident in the method, Browning hopes that more studies will be carried out to determine the effectiveness of barn owls across various cropping systems and scenarios. Roger Baldwin, a wildlife specialist at University of California, Davis, echoes the desire for more studies in this area. Together with colleagues, he is currently conducting research to see whether the birds of prey can help control rapidly expanding populations of rodents such as voles. Baldwin believes that using barn owls to control rodent numbers will be more effective if all landowners in a given area use the same method, therefore encouraging a greater regional density of owls. However, based on current knowledge, he feels that there’s no one size fits all solution to pest control, and is a firm believer in a combined approach. Baldwin believes that there will always be a place for rodenticides and is quick to address their dirty reputation. “Everyone thinks of rodenticide as one product. There are a variety of different kinds with different active ingredients. Not all of them have the same risk to non-target species and some have no secondary risks. It is a bit challenging to use the term rodenticide without understanding the differences,” he says. While second generation anticoagulants have been shown to cause harm to non-target species, Baldwin says that other chemicals such as zinc phosphide have relatively no harmful secondary effects. Overall, he feels that responsible usage is key. However, Maggie Ruffo, a wildlife volunteer with Earth Island Institute’s Raptors Are The Solution (RATS) initiative, would “strongly disagree” that any rodenticides can be used safely. The primary aim of the RATS initiative is to take rat poison off the market and educate the public in alternative pest control methods. According to Ruffo, barn owls are one tool in the toolbox of Integrated Pest Management,” and can in fact be more effective than rodenticides, which can wipe out beneficial predator species through secondary poisoning.